A couple of days ago I read and article in SEJ (25 Ways to Get Penalized in 2012) where the author mentions a series of techniques or practices that can get your website in trouble, in a post-penguin post-panda world. Buying links for advertising purposes is find, but be sure they’re denoted as sponsor links and use “nofollow” attributes appropriately. 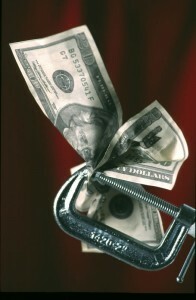 Purchasing links for the sole purpose of passing PageRank violates Google’s Webmaster Guidelines. For the last 5+ years I’ve heard paid links are bad. Buying site-wide links are black hat, Google doesn’t like them and so forth. So I have refrained myself from doing it. The truth is in many markets, Top 1st Positions in Google are dominated by people who do just that, buying links in forums, and other sites. The difference in number of backlinks with comparable sites is as much as 10:1…. With one site providing 20K links alone: sitewide links. Which generated some comments from fellow internet marketers, and got me thinking…. Do Paid Links Still Work? What Google says about Sponsored / Advertising links: Should have NOFOLLOW attribute. I must say that it is completely legitimate for website to have sponsor / advertising links in other websites, Why not? The issue is when these sponsor links don’t follow “Google’s rules”… and they do not have the rel=nofollow attribute…. Does that put them into “paid links” “black hat SEO” area? Should they count towards your “positive” backlinks, should they be “neutral”, or given a “negative” connotation, should Google penalize your website because of that? Now, things will be different if I purchase a paid link in a crappy, unrelated, garbage, regurgitated, directory or website, where it is pretty obvious to anyone, even a spider to realize the business transaction. Isn’t Yahoo Directory, BOTW and other directories paid links? Paid Links Are Bad. Do Not Purchase Links! And so when a business venture comes along and someone offers the website owner an opportunity to reach a wider audience by sponsoring a site, they, in looking to be a “good guy” and follow “Google’s Rules”, let the opportunity pass and the offer goes to his competitor who doesn’t hesitate and just takes it, leaving the first guy to bite the dust so to speak. And just like the paid link practice, there are many other ones that we will be discussing in the future, where we will try to help small business owners looking to get some business from the online world, make the decisions that will most benefit their business by using the information they read online but always, always using their own criteria to decide whether to pursue it or not. Does this website look like a legitimate business? Will exposing my company to its visitors increase my reach and my branding? Is this a place where my target market hangs out, and having my advertising here will bring in traffic and business to my website? It shouldn’t come by surprise my suggestion that if most of these answers are yes, the potential paid link has a higher value and the publisher website should be a good candidate for you. If on the other hand, most of these answers are no, then the smarter thing to do would be to not do business with the publisher website. Whether your answer is yes or no, you could see potential benefits in the terms of referral traffic and sales / conversions, and don’t be surprised if you also see an effect in your website rankings (whether is up or down). Remember that with Google’s latest algorithm changes, you are influenced by who links to you, either if you have control over it or not. But that is a whole subject to a new future blog post. What do you think? Have you purchased links and seen good or bad results? What would your recommend a friend? Time and time again we’ve had customer requesting us to create a membership website, where they can have recurring income by supplying information and/or products in a monthly basis, which is both user-friendly and inexpensive. One of the fastest ways to get a membership website started, not to mention inexpensive, is by using WordPress and a Membership Plugin, such as Wishlist Member. Why Using WordPress (WP) as Your Content Management System (CMS)? If you are looking to have a self-managed website in a matter of minutes, WordPress is your best choice. Either if you are using a One-Click Install from within your hosting account (such as Hostgator) or the famous 5-minute install procedure, you will end up with a website in less than you think. Why Using Wishlist Member as Your Prefered WP Membership Plugin? Because of the amount of flexibility and power wishlist member provides, and the very low price, nothing will beat it. Why would I need or want a Membership Website? Watch this video as an introduction to the business model of a membership website. 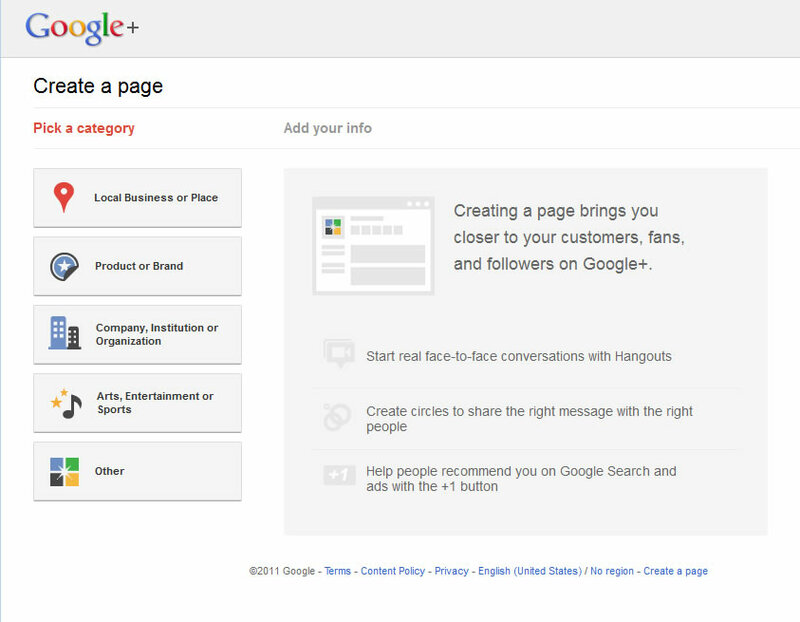 Last week Google announced the out of beta testing release of their Google+ Pages for Businesses. If you are looking to create one for your local business (which you totally should), don’t be afraid of doing it yourself: it is very fats and easy. Select “Local Business or Place” if you own a local business. Now you can start posting in your Google+ Business Page. Coming next, we will be talking about what you can do to get your Google+ Business Page noticed, and other tips and tricks to make the most of Google+ for your business. Google Panda was a significant algorithm change done by Google on February 2011. According to Google, the main goal of this update was to identify low quality sites that may not provide the best experience for users. The main target was sites known as “Content Farms”, or sites that publish user-submitted content, (done mostly for link building reasons), and don’t have the appropriate quality control, therefore publishing low quality content. Since its launching, we’ve been monitoring high traffic sites to see how this change might affected them in terms of visits and page views. As expected with the “Social Media Boom”, social networks such as Facebook, Twitter or Linkedin haven’t been struck in any way by this update, on the contrary, they have experimented increases on the number of page views during the last three months. For example, Facebook almost increase in 30% its number of page views. Aligned with the increasing popularity of social networking sites, Yelp, the most visited user reviews site, has grown 22% in the last three months. This boost confirms that everyday consumers pay more attention to reviews and they are starting to play an important role during customers purchase decision process. Article sites and content sharing sites, such as Associated Content, Ezine Articles, Buzzle or Hubpages have experienced a notable decrease in traffic. We analyzed 10 of the most visited sites in this category and the results revealed that in terms of page views, there had been an average fall of 25%. Hence, if you rely mainly in article sites to get traffic to your website, it’s definitely the right time to start considering other sources of traffic or other marketing strategies to keep your website alive and to keep visitors coming. Certainly, we can’t asseverate that all articles in all niches have been affected by the Google Panda update. Your business may be in a specific niche with a low or medium level of competition where your articles are still ranking and getting traffic. If so, you are in luck at least for now. Conversely, we would like to make a particular comment about E-How since at the beginning this site wasn’t affected by the update and this fact generated a lot of controversy. As we can see in the Alexa graphic below, E-How finally got caught and there’s an important decrease in pageviews starting on April 2011. We also included in our analysis, blog sites such as, blogspot, wordpress and typepad and unlike Article Directories, they have increased in the amount of visitors and pageviews. So, if you thought that blog marketing was an old-fashion strategy, you may be wrong. We believe that Google might be favoring blogs with good and fresh content that provide a high-quality users experience and they’re probably getting the traffic that content sharing sites lost. So, here comes the obvious question: Has article marketing as an SEO strategy lost its efficacy? Although Article Marketing has without a doubt lost some of its shine, we believe that it can still be an effective tool in some niches, when it’s done right. But, what does “done right” entail? Below we outline what we consider are the three most important points you need to consider in your article marketing plan. 1. Relevant and high quality content with perfect grammar: Google will see your article with “better eyes” and you may have the possibility that someone re-publish it, which will mean more links to your website. 2. Target long tail keywords: Although their search volume can be low, they can be much less competitive and you’ll have more chances to rank on the search engines and get some traffic. 3. Quality before Quantity: Focus your efforts in high quality sites. We believe that mass distribution to sites with doubtful quality may harm your site and your credibility instead of helping it. We recommend submitting your article only to sites with high traffic volume and good reputation. That’s it for today’s post. Hope you find this information relevant and more important helpful for your online business. We are going to continue monitoring these sites and we’ll keep you updated of any new finding. We’d love to hear what you think or about your own experience. Have your articles been affected by Google Panda? Have you seen a decrease in their traffic? Since its introduction last March, Google +1 has stirred up lots of conversations around the globe. 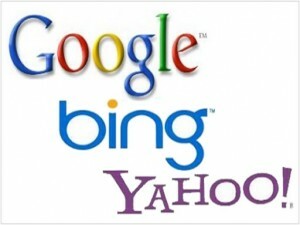 Its impact in the world of search engines and organic and paid results is still somewhat unknown. Maybe you just heard about Plus One, but are not sure what you should do with it. 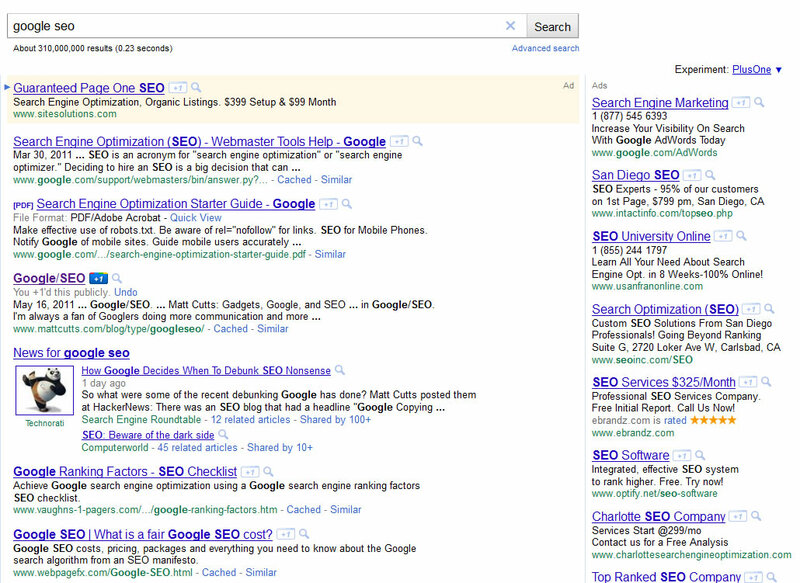 +1 is Google’s version of Facebook’s like button, applied to Search Engine Result Pages. It was conceived as an easy way for users to get and give suggestions or recommendations in the search results pages. The +1 buttons appears next to your headline on search ads and organic results. Personalized annotation (derived from +1) appear beneath your Display URL. “This is something you should checkout”. Who can see My +1’s? By default your +1’s are “public to the world”, but that doesn’t mean everybody will see your +1’s. Only your Social Connections will see them –if Google consider they will benefit from it-, as explained by Google, your Social Connections include people in your Gmail Chat List, people in your Google Contacts, people You follow in Google Reader and Google Buzz, and occasionally you might see +1’s from people you don’t know. In order for an user to see the +1 button, they must be signed-in on Google.com. You can choose whether or not to display your +1’s in your Google Profile. How can Google +1 Help My Website? Just like the like button, +1 gives your content a peer recommendation and endorsement from your social media circle and the world in general. How is +1 different from the like? The main difference is +1 votes will show up on Google’s SERPS, plus you can +1 webpages (and Adwords Ads) directly from the SERPS, this can potentially influence clicks directly from search pages. Will +1 affect my Organic Search Engine Rankings? We predict that adding the ability to +1 your pages can and will benefit your website’s traffic directly from Google’s SERPS and hopefully the conversion rate of your pages as well. 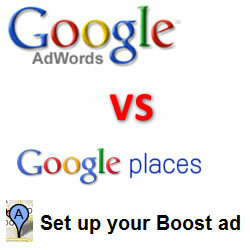 How does +1 affect my Adwords ads? The premise is “anything that can make your ads standout –especially for free- will help your click thru rate”. If we add the power of endorsement from people in your network, +1 can potentially increase both your CTR –and your spending- and potentially the conversion rate for those visitors, as the trust factor can increase as well. 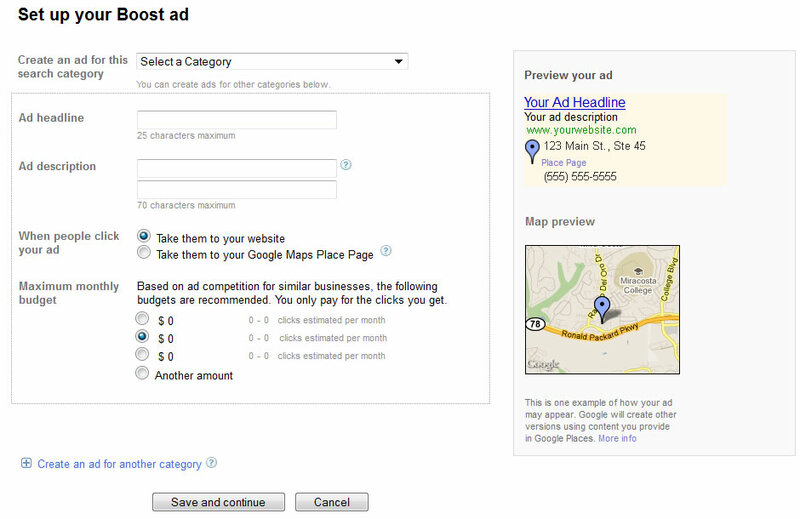 Do I pay if someone +1 my Adwords ad? No, you will only pay when someone actively click on your ads. Can I add +1 to My Website? As of today, June 1st, Google enabled the Google Plus One for websites. Read this for an easy way to add +1 to your website, or if you are an experienced developer who wants to customize plus one. Are you planing to implement plusone in your website? If so, When are you planning on implementing it? What do you think about Google Plus One? We think Google +1 can potentially affect ranking, traffic and conversion in the mid to long term, and we would love to hear your thoughts. Google Wallet – The Future of Mobile eCommerce? Today is a new day for the Mobile Shopping World: Today Google announced its mobile payment service, called Google Wallet, which allows users to store credit card info, offers loyalty cards and gift cards. Using the Google Wallet System, users will only need to tap your phone on the reader (MasterCard’s PayPass Merchants) to send payment ( and loyalty card info if enabled) to the merchant, just like you would do with a credit card. The Tap-To-Pay system will be enabled anywhere the MasterCard PayPass is accepted. Merchants willing to participate will join Google’s SingleTapTM network, which at the time of this writing is composed by AE Outfitters, Bloomingdales, Subway and Toysrus among others. I anticipate users will be concerned about security, and this is how Google Addresses this issue: by using a Google Wallet PIN that must be entered before making a purchase. Plus enabled phones incorporate a chip called the “Secure Element”, which is described as a “separate computer, capable of running programs and storing data” allowing only trusted programs to access the info stored on it. As with any credit card, Google suggests if your phone is lost or stolen, call your banks to cancel your cards. Currently, Google Wallet is only enabled in Sprint’s Nexus S 4G by Google; and funds can be drawn from Citi’s Mastercard and Google Prepaid Card. The technology that makes this possible is called Near Field Communication (NFC), in the form of that called “Secure Element” NFC chip in the user’s phone, therefore the reach of this new payment system will depend on the adoption or not of mobile phone manufacturers and its inclusion in future models. Google itself expects that only 50 percent of handhelds will carry NFC chips by 2014. There is another option for those who want to use the power of NFC technology but do not currently own an NFC-enabled handheld, which is the addition of an NFC sticker, which can be affixed to Android 2.3.x phones, enabling communication with the NFC reader. These stickers however, can only support one credit card, which can be a limitation to some but it is in general good news for those who want to jump in the Google Wallet frenzy right away. The future of Google Wallet is still unknown, especially with the news that Paypal filed a lawsuit against Google and its mobile payment system. So I would say most business owners should wait and see how Google Wallet develops, and if it does get off the ground, I would consider premature to worry about this just yet. I would keep my eye on the possibilities of mobile marketing, as it is just taken off right now: mobile marketing brings lots of possibilities for every company, even the smallest ones. Digital Sources is a Search Engine Marketing Company located in Carlsbad, CA. We’ve been in business for more than 6 years serving local businesses in San Diego County, as well as other businesses outside California. Our ideal customers want to get their business online, or to be found online, for both local and national results. Maybe you own a website and is doing nothing for you. Maybe updating your website is very cumbersome so you don’t do it. You are probably not getting a single report on how your website is doing / has done in the last month, quarter, or even a year.